zingThe ZINGER™ Professional 4500 weighs 37 lbs. and measures 38”L x 24”W x 30”H. This size will accommodate large sized dogs (labs, boxers, shepards, pitbulls, etc.) who tend to be longer and taller. Aluminum Construction – ZINGER™ metal dog crates are constructed from lightweight aircraft grade aluminum which is known for its durability and strength. 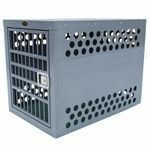 Aluminum crates are perfect for dogs who often destroy or break out of plastic and wire crates. While built to be strong and secure, Zinger crates are light enough to be handled by one person with little effort. Ventilation – A Zinger crate is fully vented down each side and along the back wall to provide maximum comfort for your dog. Their open design allows air to pass freely thru the door aided by the triple rows of lower and upper vent holes which surround the crate. By its very nature aluminum quickly dissipates heat making it a great material to construct dog crates provided there are enough air holes. Lots of adequate venting ensures your dog will remain safe while in its crate. Airline Travel Approved* - ZINGER™ crates exceed the strength and ventilation requirements by most airlines. By installing Zinger's optional "Airline Rails*" the crate can be used to ship a dog by air. Strong aluminum crates will not bust or be broken by rough handling or shifting cargo loads thereby safe guarding your dog on route. When you ship your dog in a Zinger crate he is protected. Backdoor Option - All models can be fitted with a second door for front and rear access to your dog. This option comes in handy if you transport your dog in a minivan or SUV. 30 Minute Assembly - Each crate is shipped in a knocked down form to reduce the size of packaging and shipping costs. The shipping rate is $44.95 to anywhere in the lower 48 states and Canada. Assembly will take approximately 30 minutes and requires a phillips screwdriver and crescent wrench. Mounting holes for optional handles, airline rails and caster wheels are predrilled at the factory for easy assembly. 38”L x 24”W x 30”H - Weighs 37 lbs. Warranty: Each Zinger dog crate is constructed from strong lightweight aircraft aluminum with silver hammertone powder coat. Use it for 30 days after which time you may return it for a full refund minus a 15% restocking fee if you are not satisfied. Their dog crates come with a 1 year warranty on all parts and powder coat. When choosing the proper crate for your pet, keep in mind that his SIZE is more important than his weight. A pet should have a crate 6" longer than his body length and 6" higher than his shoulder height for maximum comfort.